When will I see a doctor or nurse? The average emergency department visit is a little over 3 hours. However, some last 6 hours or more. Do I have to wait in the lobby? If you need to step away from the lobby, check in with the person calling out names so they'll know that you'll be returning. Vending machines and restrooms are located next to the lobby. Please do not eat or drink if a nurse has instructed you not to. That conversation may look like a standard text message exchange, but it's not. 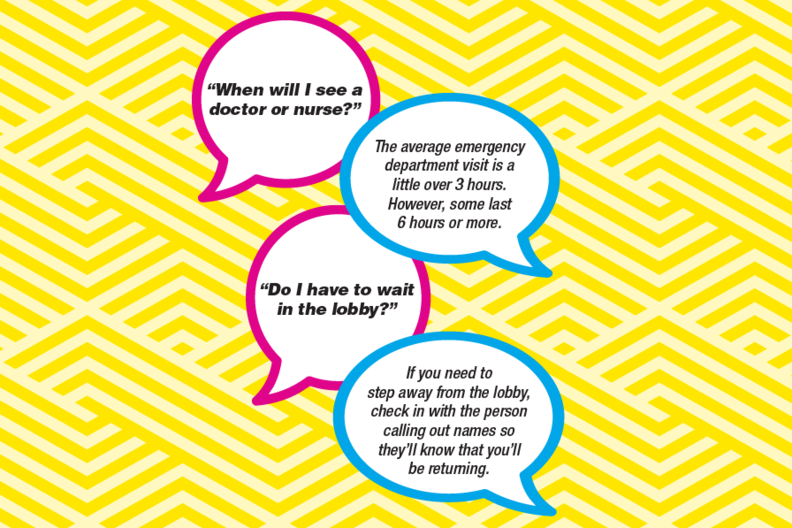 For one, patients don't usually get answers about their emergency department visits via text. And they especially don't often get answers from a bodyless bot. But if artificial intelligence continues to progress and consumerism continues to impress on hospitals the importance of connecting with patients, this may soon be standard. Chatbots are already widely used in other industries—especially retail, where they're hard to avoid in online customer-service interactions, even if the customer doesn't realize what they're chatting with. And chatbots are gaining traction in healthcare, too, helping connect patients to providers and payers on an efficient, cost-effective medium: mobile devices and computers. While providers are putting chatbots in place on their end, helping patients navigate their care and stay on care plans, payers are getting into the chatbot game too, with AI that's designed to help members understand their benefits. “You're starting to see the early adoption of chatbots in healthcare across all aspects of the patient journey,” said Brian Kalis, managing director of digital health and innovation for Accenture's health business. “In a healthcare context, chatbots provide simplicity and convenience for consumers and better labor, productivity and connection to consumers for providers,” Kalis said. Northwell Health, for example, is trying out chatbots to help patients navigate oncology care, and Premera Blue Cross recently launched Premera Scout, a chatbot to help patients understand their benefits. The Mayo Clinic is delving deeper into the technology by researching voice-activated bots. “If you're trying to meet patients where they are and where it's convenient for them, then the place to meet them is texting on a mobile phone,” said Greg Johnsen, CEO of LifeLink, which powers the technology for the emergency department chatbot that generated the conversation above. Chatbots can improve the customer experience, and improve efficiency. If most of the dialogue and the content is automated, costs will fall sharply, Johnsen said. Most if not all organizations using chatbots are so early in their chatbot programs that they don't have cost savings numbers yet. “Cost savings are translated in many ways. Patients don't end up coming back to the ED or getting admitted,” said Sabina Zak, Northwell's vice president of community health. Engagement, on the other hand, is easier to measure. About half the patients Northwell asks to try using post-discharge care-management chatbots say yes, and 96% of those who enroll and complete at least one conversation say it's helpful. One pilot, which launches soon, is a chatbot to help patients prepare for a colonoscopy. After a patient makes an appointment, a chatbot made by Conversa Health will get in touch via text message or email, delivering educational materials and trying to address any concerns. One goal is to make sure patients come to their appointments prepared, so the procedure doesn't have to be canceled at the last minute—something that costs the hospital time and money. Northwell is also using chatbots to keep patients engaged after they're discharged from the hospital. Any patient—or their caregiver—enrolled in transitional care management is eligible to use the chatbot service, available in both English and Spanish. A link sent to patients launches a HIPAA-compliant web interface, usable on mobile devices, where patients have conversations with chatbots about either their specific conditions or more general discharge topics. A patient who was in the hospital for heart failure might get questions about their weight, for example. Because a chatbot can check in so much more frequently than a person could on the phone, Northwell gets about four times the discrete information from patients than it would with phone-based outreach. “Having one person call one person takes a lot of human capital,” said Dr. Zenobia Brown, medical director of Northwell Health Solutions, Northwell's care-management organization, and vice president of population health for Northwell. Vendors of the chatbots are focused on using web-based interfaces and text messages, not specific apps. “There's a huge amount of app fatigue,” said Kyle Cooksey, president of CareThrough, a care-management platform that, with LifeLink, offers healthcare chatbots. Health systems overall can benefit, too. In the case of LifeLink, the chatbots help with referral management, ensuring that patients actually go in for follow-up appointments, which are a source of revenue. Studies put so-called “leakage”—when patients don't follow through on referrals—between 20% and 50%. When patients don't show up for a follow-up appointment, it costs a provider, on average, $210. Johnsen estimates that LifeLink chatbots can save medium to large emergency departments between $2 million and $5 million annually. LifeLink said its chatbot technology, which is a cloud service, costs hospitals monthly subscription fees of $3,000 to $20,000 for use in emergency departments, with the cost based on how many patients go through the ED. “We're surrounded by work that is being done over and over by humans that's not necessarily the best use of their time,” Johnsen said. Chatbots can free up not just the operational teams to slash costs, but those human resources can be redeployed to much higher value areas, he said. The same is true for payers. Premera launched its Premera Scout chatbot first with a focus on eligibility and later with added capabilities for answering questions about benefits and other insurance services. The company will continue to improve the chatbot—which takes the form of a blue owl—using data from calls and chats to add knowledge to the chatbot. Chatbot developers also must be extra careful to provide credible information, which is crucial in healthcare, more so than in other industries, like retail. “You need to have a very high level of trust in place,” Bitran said. That trust extends to trust of the privacy and security of the chatbot, which is, in the end, just another piece of software. Microsoft and others take into account HIPAA compliance, ISO certifications and other privacy and security regulations. Those can limit the contexts in which the chatbots can work and the information they can share. There are other limitations to chatbots in healthcare. One big one is how much they know, since they're programmed to do a limited set of things. That's why chatbot designers are creating their workflows to lead to real humans should the need arise. That's why health systems, hospitals and payers must understand how chatbots complement their other customer service channels. They should, for example, lead to humans when they can't handle a request.